The 2017 Maruti Suzuki Desert Storm was an interesting event. One with a huge upset in the Moto category. 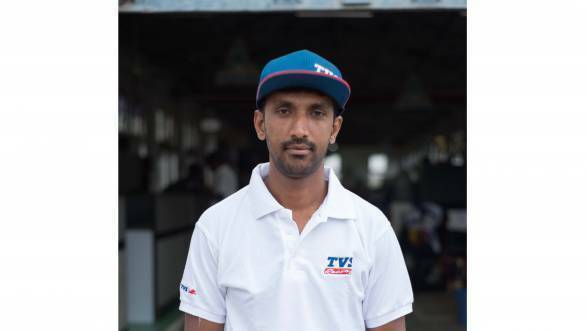 TVS Racing's R Nataraj had pressured Hero Motorsport Team Rally's CS Santosh all through the rally, but it seemed like he'd have to settle for second. But it isn't over till it's over. 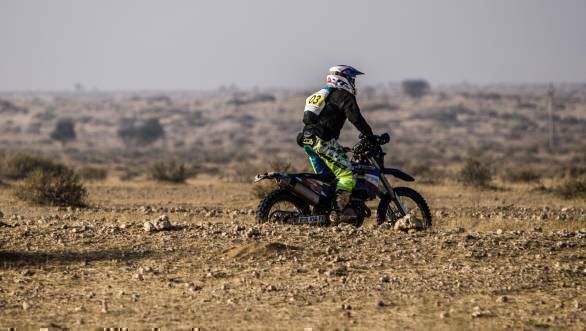 Which is why when Santosh checked in late on the very last transport stage, and was demoted to third in the Moto class, victory was Nataraj's. But that's not to say that Nataraj isn't able to compete with the very best. The TVS Racing rider has been known to be a formidable opponent, and has several records to his name at the Raid de Himalaya. In an email interview with OVERDRIVE, Nataraj spoke of his Desert Storm win, his hopes for the 2017 season of motorsport, and how he's aiming to compete in an international event in the future. OVERDRIVE: The 2017 Desert Storm victory means that you've gotten off to a good start this year. How important was this win for you? Especially since it was not something that you were expecting. R Nataraj: This Desert Storm victory is very special to me as it gives me confidence as we start a new season. Every race is very important to a racer and we focus on giving our best as it builds up momentum for the next one. I was quite happy with my performance as I was able to maintain good speeds all through the rally despite challenging conditions. The rally demands good physical fitness and navigation skills. Of course, the TVS Racing crew played a major part in ensuring my motorcycle was in top shape at the start of every stage. OD: Can you tell us what your expectations were going into the 2017 Desert Storm? RN: I want to give my best shot in all racing events I participate in. I have been training really hard over the last few months. The team at TVS Racing were quite keen to do well at Desert Storm and it's their support that also helped the win. OD: What were the biggest challenges that you faced at the Desert Storm this year? Was the 200km long stage tricky for you to handle? RN: Riding and navigating through the desert sand has its own challenges and so keeping a cool head is the key. Riding in sand dunes demands different riding posture so I had to work on that as well. Manoeuvrability and switching to different riding line was extremely difficult and exhausting. The 200-km stage is definitely long but that's the true test for me and my machine. It was a gruelling yet memorable experience. OD: How much training goes into an event like the Desert Storm? Of course, we know that you race competitively all year round. But you do have something of an off-season before Desert Storm. Can you talk us through your routine? RN: We prepare all through the year irrespective of events/ races organised every year. Maintaining high fitness level and a lot of time on the bike is something we have to do. My time on the bike increases before any major rally raids and the fitness regime becomes more strenuous. TVS Racing ensures that we are 100% fit and ready before any race. OD: What other championships are you competing in in 2017? The next big event is the Raid de Himalaya? RN: I plan to participate in all major rally and supercross national championships this year. Of course, participating in Raid de Himalaya will be special as I have enjoyed riding in the Himalayas. I have made various records in earlier versions of Raid de Himalaya and look forward to this season. OD: When do you typically start training for the Raid? Do you do any sort of high altitude training, or is it just the regular training of competing in various other Motocross events? RN: At TVS Racing, there are separate modules developed for each rally. We had done a bit of training in the deserts before preparing for the Desert Storm and similarly we do high altitude training for the Raid. I am quite familiar with the conditions and that experience will help me prepare well for the Raid. OD: Are there bigger plans and perhaps more events that you are aiming to compete in the future? RN: I look forward to participate in all motocross and rally events organised in India this year. The more I ride, the better experience I will get and that is what differentiates a good rider from the average rider. OD: What is an event that you haven't yet done, but are hoping to be able to do some day? RN: I haven't participated in any international rally raid so far. With the support and training from TVS Racing, I am very hopeful that TVS Racing will nominate me for international rally events in near future. OD: What are your goals for the 2017 season of racing? RN: My goal remains the same. Focus and give my best in every race I participate.